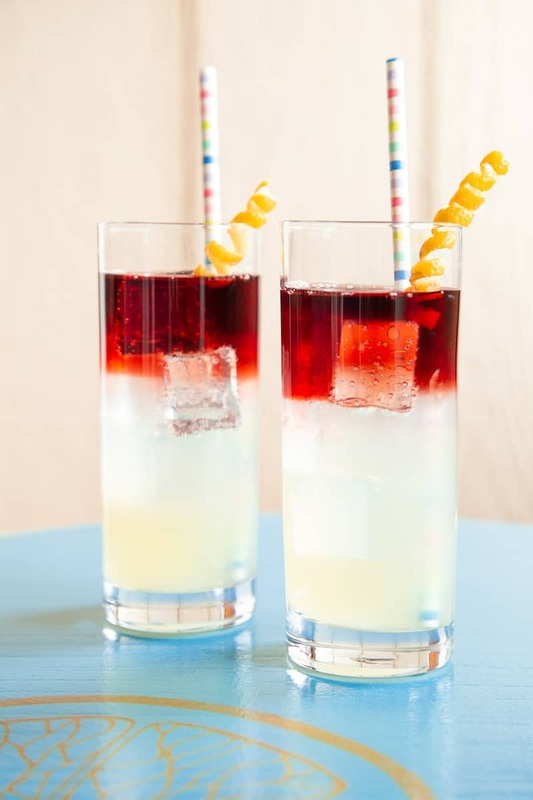 Red Wine Spritzer (New York Sour) Recipe | Good. Food. Stories. Anyone who grew up in an Italian family remembers his or her first taste of wine: heavily diluted with water and very likely served in a sturdy juice glass. That was me, swinging my legs from a creaky metal chair on my grandparents’ patio, politely sipping from a cup emblazoned with sunny Florida oranges and proud to be sophisticated enough to drink the same thing as the grown-ups. Thinking of those first childhood tastes of wine, the splash of water in my tiny tumbler bringing out the fruity flavors and smoothing out the bitter tannins for my young palate, made me realize that what I was drinking back then was really a basic variation on the traditional spritz cocktail. Over the past few years, these fizzy, summery drinks have reclaimed their rightful place at the table as cocktail enthusiasts have explored the varied (and storied) traditions of the European spritzer. Most of us know the Italian spritz best—Aperol, Prosecco, soda—but there’s a world of spritz cocktails out there (more than a book’s worth, in fact!) 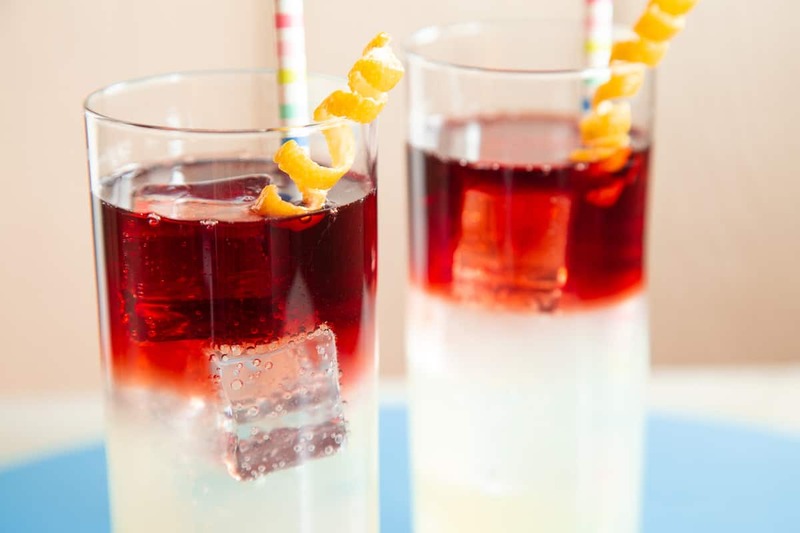 that pair wine with carbonation, including the Spanish tinto de verano, aka red wine and lemon-lime soda. Riffing on this centuries-old practice became my obsession as I perfected my go-to recipe for a summery red wine spritzer. Subtly savory but still thirst-quenching, and most certainly not diluted in flavor or body in any way, my new favorite warm-weather wine cocktail takes its cues from the tinto de verano and the New York Sour, a wine-topped version of the classic whiskey sour that’s also been knocking around since the 19th century. My spritzer whisks the whiskey out of the equation for a more sessionable spritzer, something you can easily down a few glasses of while relaxing in a hammock or rocking on the porch all afternoon and still be no worse for the wear. 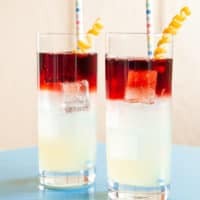 I’ve made this cocktail with pretty much every wine I’ve happened to have open at the time, from jammy Zinfandel to light-bodied Beaujolais, so there’s no need to get fancy with the wine you choose for your float. If you want to find me when July rolls around, I’ll be drinking a tumblerful on my own patio—relaxing in the same chairs that once graced my grandparents’ backyard. Leave white wine on the shelf this summer and try a refreshing red wine spritzer, made with homemade sour mix, for a change of pace. Stir the sugar and water together in a small saucepan over medium heat. Bring to a simmer, stirring occasionally until the sugar has completely dissolved and the syrup is clear. Pour into a heat-safe jar, like a Mason jar, and cool to room temperature. Stir in the lemon and lime juices. Fill a Collins glass or other tall glass (like a juice glass!) with a handful of ice cubes. Gently stir 1/4 cup sour mix and 1/3-1/2 cup sparkling water into each glass. 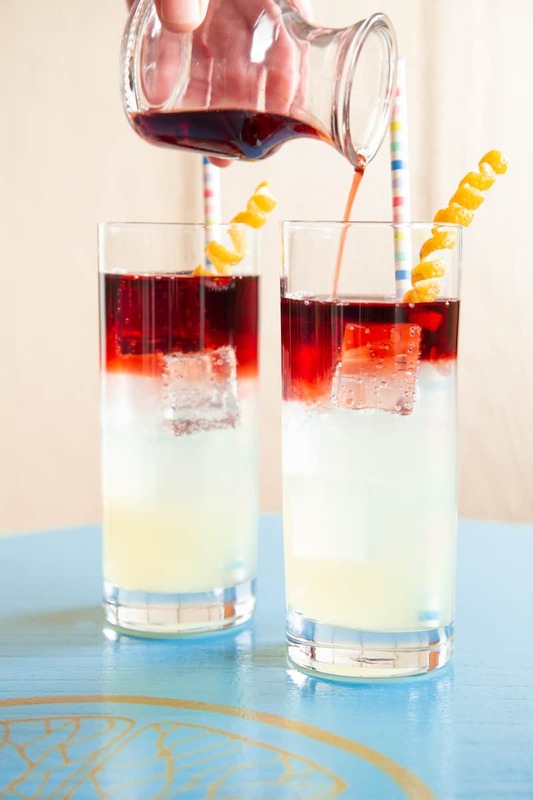 Top each with 1/4 cup red wine; if you pour gently, the wine will float on top of the soda, slowly bleeding into the cocktail as the ice melts. Stick a straw and/or a cocktail stirrer in each glass and serve immediately. You and your fellow drinkers can choose to mix the wine into the rest of the cocktail or let it slowly meld together on its own. Store the sour mix for up to 2 weeks in a sealed container in the refrigerator.